A big family reunion at the weekend cottage around traditional food preparation ”kotlovina” – quaintly amusing and earnest situations revealing what is stronger: ties of blood or culture and the way of living. Mimi, a forty-something widow from Australia comes to Croatia for the first time after she left as a little girl. She wants to visit her two elder sisters and to meet other members of yet unknown family. Her sister’s stepson Jacob, a young man in his twenties, met her at the airport and they hit the road towards the village where the family is eagerly expecting Mimi. But the trip turned to an adventure; Mimi and Jacob got involved in a love affair. 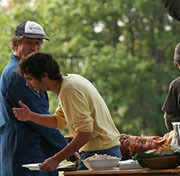 Upon arrival, where all family members are gathered around traditional food preparation called “kotlovina”, it is impossible for Mimi and Jacob to hide their involvement. Sister Ana, Jacob’s stepmother, is reacting emotionally and angrily, but even other family members cannot suppress a variety of reactions. 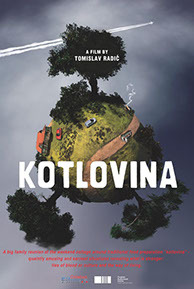 Thus, all assembled around “kotlovina”, we encounter a gallery of characters having different believes, moral judgments and dubious political opinions. Tomislav Radić is one of the most known Croatian film, TV and theatre directors. Radić graduated from the Academy of Dramatic Art in Zagreb in 1973. He directed numerous theatre plays, as well as over forty TV-plays and documentaries for Croatian Television where he was Head of Drama Department from 1997 to 2000. From 1978 to 1997 he was a tutor at the Academy of Dramatic Arts in Zagreb, Department of Acting; from 1981 to 1985 he was Dean of the same Academy. His internationally awarded feature films include “The Living Truth” (1971), “The Harbour” (1973), “What Iva Recoded on October 21st, 2003” (2005), “Three Stories About Sleeplessness” (2008) and “Kotlovina” (2011).